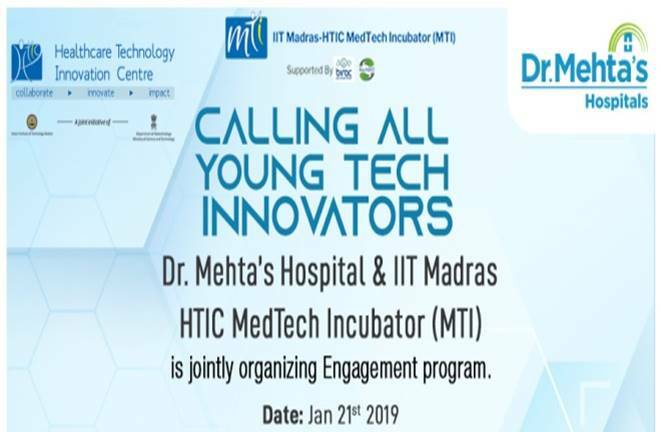 Engagement program is organized by IITM HTIC MedTech Incubator in collaboration Dr. Mehta’s Hospitals. It is convergence of technology & medicine that provides a platform to medical enthusiasts, engineers, developers, designers to identify a real time problem & solution or solve a pre-determined problem faced by Dr. Mehta’s Hospitals. Theme - Affordable and Scalable Healthcare ( Focus Areas - Analytics, Diagnostics, Wearables, Digital Health).